The automatic threader feature on your Brother sewing machine is a convenience that eases most sewing tasks. However, it can frequently seize up and require you to stop work. In a few easy steps, you can diagnose the problem and easily reset the auto-threading mechanism. Fixing these jams yourself will reduce trips to the repair shop, add to your enjoyment of sewing and increase the operating life of your Brother sewing machine. Raise the needle by turning the handwheel counter-clockwise so that the wheel mark is pointing up, and try operating your sewing machine again. This will clear most automatic threader issues if your machine is clean, properly threaded and using appropriate needles and thread. Unplug your Brother sewing machine. Unthread the automatic feeder by clipping the lead end of the string and pulling the thread through the machine by the spool. Remove the needle by turning the handwheel counter-clockwise so the mark is pointing upward. Loosen the needle clamp with a small screwdriver, and pull the needle downward and out. Remove bits of thread that are caught in the automatic threader, using tweezers. Spray the automatic threader gently with a few quick bursts of condensed air to remove dust and other debris. 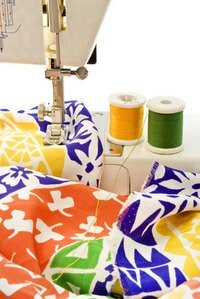 Replace the needle, rethread your machine and sew a test cloth to see if it is operating correctly. If none of these options corrects your automatic threader problems, take your machine to a Brother authorized service provider. A Brother automatic threader will not work with transparent nylon thread, metallic thread or thread with a thickness greater than 130/120. The threader also will not work using a wing needle or a twin needle. If your machine is not properly threaded, the auto-threader may frequently jam. Always unplug your machine from the electrical outlet when making adjustments.